An interesting walk with some great scenery, going to the small and interesting, historic cemetery at Upper Mangrove. 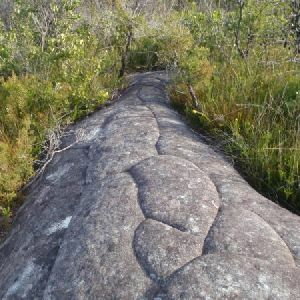 Evidence of Aboriginal activity in the area stretches back at least 5000 years. Early European settlement in the area was concerned with timber, and produce farming, before the area also became established as a stop-off for travelers on the Great North Road. From the car park (a small clearing about 450m along the unsignposted Dubbo Gully Rd. Dubbo Gully Rd is found a by turning left off Waratah Rd when it becomes unsealed, about 4km from Mangrove Mountain shops), the walk follows the management trail down the hill and soon passes around a gate. There are some beautiful rock overhangs and scenery along this section of the walk. The walk continues to wind down the hill for a long while and eventually reaches the signposted intersection with the ‘Upper Mangrove Creek Rd’ (just before a bridge). Continue straight: From the intersection, the walk follows the management trail (now Ten Mile Hollow Rd) and immediately crosses the longer bridge (leaving the shorter bridge with a gate to the right). The walk meanders along the trail for some time, passing an old ‘134’ sign to the right and a few old orange trees to the left. Soon after passing under some high voltage power lines, the walk arrives at a historic cemetery. The Upper Mangrove Cemetery is on the western bank of Mangrove Creek, near the junction with Newmans Creek. 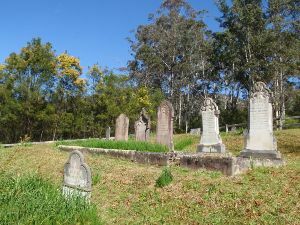 The cemetery was part of St Thomas’ Church of England, however the church building was destroyed in the 2002 bushfires. Exploring the cemetery gives a glimpse into the history of the valley. 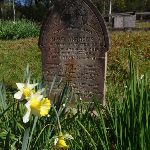 You will find the stone remembering Alfred and Amanda Andrews who built ‘Fairview’ in 1922 and read of the loss of Leslie Starkey’s parents in 1913. On the other side of the road, up the hill, is the remains of of the old St Thomas’ Church building. More info. Continue straight: From the cemetery, the walk follows the management trail down the hill, leaving the cemetery to the left. The trail meanders along the valley for some time, passing a swampy area to the right and a large grassy clearing to the left. A short distance later, the walk reaches the signposted intersection with ‘Donny’s Track’. Continue straight: From the intersection, the walk follows the management trail down the hill. The walk soon passes around a gate and continues a little further, passing around a swampy area to the left and immediately arriving at an intersection near a gate. The trail behind the gate leads to an old abandoned house and shed, which could provide some shelter. Continue straight: From the intersection, the walk passes around the gate and follows the management trail steeply up the hill. The trail soon arrives at an old, abandoned house. At the end of this side trip, retrace your steps back to the main walk then Continue straight. Fairview (550 Ten Mile Hollow Rd, Mangrove Creek) is a property with a homestead, built in 1922 by Alfred Andrews. The homestead and adjoining slab hut are now fenced to protect them, however the large corrugated iron shed on the south side is still open. 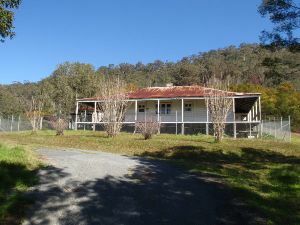 The homestead was once a popular rest area for people traveling the North Road, via the Simpson track. The home was privately owned until 1973 when Gosford City Council acquired the land to protect the catchment area. The home was rented until 2002, when the tenants moved due to the threat of bushfires. The building is now in poor condition and the ‘Friends of Fairview’ are exploring ways to save the building and restore the history of the valley. Save Fairview More info. Around 2.5km of this walk has short steep hills, whilst the remaining 1.1km has gentle hills with occasional steps. 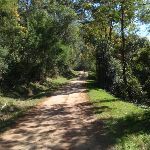 This whole walk, 3.6km follows a clear and well formed track or trail. Around 2.5km of this walk has directional signs at most intersection, whilst the remaining 1.1km is clearly signposted. This whole walk, 3.6km requires no previous bushwalking experience. This whole walk, 3.6km is not usually affected by severe weather events (that would unexpectedly impact safety and navigation). This whole walk, 3.6km has limited facilities (such as not all cliffs fenced). A list of walks that share part of the track with the Dubbo Gully to Upper Mangrove Cemetery walk. This two day (or ten hour) walk follows several historic roads, now closed to traffic. Starting with a walk down to Dubbo Gully and past an old cemetery, you will then explore some old farms before coming to Simpsons Track. Here, head up the hill to come to the Ten Mile Hollow Campsite. 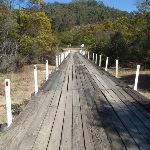 The next day you will follow the Old Great North Road to Clare’s Bridge (second oldest bridge on mainland Australia). 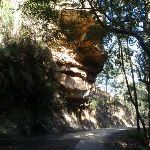 A bit further along the Old Great North Road, you then head down Donny’s track and return to the start via Dubbo Gully. A great way to explore the history and beauty of the area. 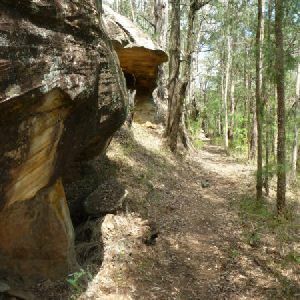 This walk follows a section of the Old Great North Road along the borders of the rugged Yengo and Dharug National Parks, to then visit more historic sites in Dubbo Gully. This is more of a historic journey than you typical bushwalk. There is a campsite at Ten Mile Hollow providing a comfortable place for the night before visiting the Historic Clare’s Bridge. Soon after Clare’s Bridge this walk leaves the old Great North Road to follow Donny’s Track down into Dubbo gully were you get to explore this historic farming area before walking out to Upper Mangrove. This walk is mostly on wide trails and therefore can also be done as a mountain bike ride. This two day walk follows a series of historic roads along clear and wide management trails. This walk explores the great views from Western Commission Track, the sandstone handicraft on the Old Great North Road and the farming history of Ten Mile Hollow, and also offers a side trip to Clare’s Bridge. 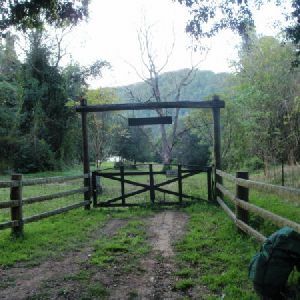 Camping at the well-established Ten Mile Hollow campsite, this walk is great for those who enjoy walking on trails, visiting convict sites and early settlement historic places. 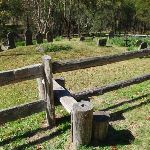 A list of walks that start near the Dubbo Gully to Upper Mangrove Cemetery walk. 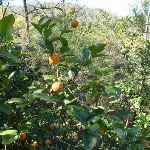 This pleasant walk explores the rural valleys and a beautiful section of Jilliby State Conservation Area. Starting at Ourimbah Valley Trackhead you walk into Hidden valley along the dirt road, to then follow a trail beside Ourimbah Creek to Stringy Bark Point. 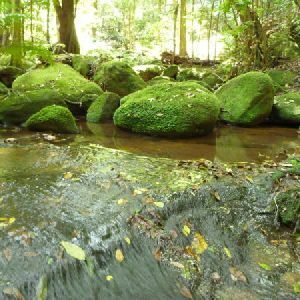 This is a pleasant mossy area with many ferns and near a wide sandy section of Ourimbah Creek. 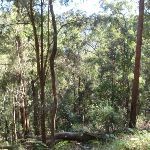 A bit further on you cross Ourimbah Creek then walk up the ridge to the dirt Tooheys Road. 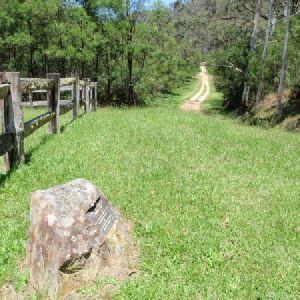 From here you walk along the little used dirt road to Forest Road, passing through the tall eucalypt forest and through the Tuggerah Lake Field Archers club area. A side trip at the end of this walk gives you the option of staying at Forest Park. 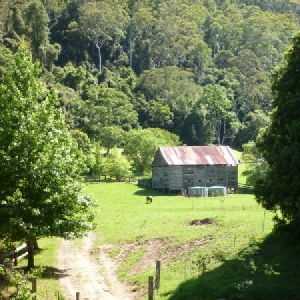 This pleasant walk explores the rural valleys and a beautiful section of Jilliby State Conservation Area. Starting at Ourimbah Valley Trackhead you walk into Hidden valley along the dirt road, to then follow a trail beside Ourimbah Creek to Stringy Bark Point. 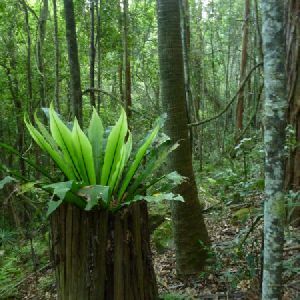 This is a pleasant mossy area with many ferns and near a wide sandy section of Ourimbah Creek. 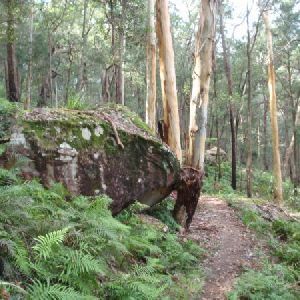 A bit further on you cross Ourimbah Creek then walk up the ridge to the dirt Tooheys Road. After turning off the old Tooheys Rd the Great North Walk leads along a narrow track and across the mossy and delightful Dead Horse Creek. The track then meanders through a heath and scribbly gum forest to Cherry Lane. After about a 1.5km road slog this walk leads you to a GNW trackhead on Great Rd. A nice walk through Popran National Park with good views along the way. The optional side trip to Mt Olive adds some great views and scenery. If you have a car with good ground clearance, you could drive to Ironbark picnic area and start the walk from there. A great circuit walk in Popran National Park, to the beautiful Emerald Pool. This walk passes through a variety of vegetation and offers some great views along the way. 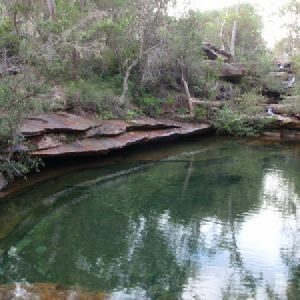 Emerald Pool is a really beautiful spot and it is well worth spending some time exploring around the creek. The optional side trips along the 248 trail and to Mt Olive, add to the great views on the walk. 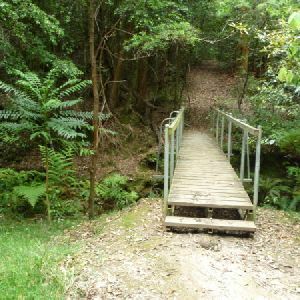 If your car has reasonable ground clearance, you could drive to the Ironbark picnic area and start the walk from there. This walk, mostly in Popran National Park, passes through a great variety of scenery and beautiful views. 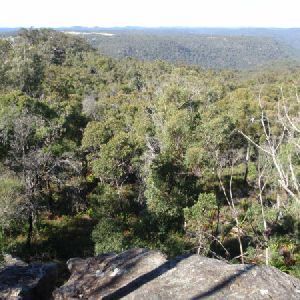 The early part of the walk, along a ridgetop, is through relatively dry forest with some great views, while the steep but beautiful descent to Glenworth Valley is through moist, fern filled forest. The cafe at Glenworth Valley is open on weekends. There is also an optional sidetrip for some nice views from Mt Olive. A very nice walk to a viewpoint on top of Mt Olive, in Popran National Park. The walk passes through nice forest, and offers good views over Popran National Park from the top of Mt Olive. If you have a car with good ground clearance, you could drive to the picnic area, making the walk shorter. 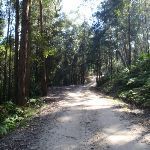 This section of the Great North Walk explores a section of the historic Bumble Hill Dray track. 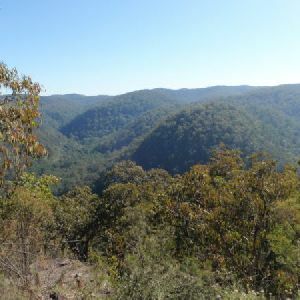 You will walk along the edge of ridge mostly through an open dry eucalypt forests and occasionally through moist ferny gullies as well as alongside the base of a tall rock wall. Bumble Hill Dray track was cut during the mid 1800’s to allow teams of bullocks to haul felled cedar to Mangrove Creek, where a barge would take it to Sydney. The oxen are now long gone, but this is a great way to lead into the small Yarramalong township. 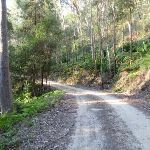 This section of the Great North Walk explores the rural area of Kulnura as you walk along the roads before heading along the historic Bumble Hill Dray track. 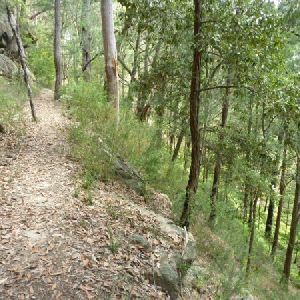 This track leads you along the edge of ridge mostly through an open dry eucalypt forests and occasionally through moist ferny gullies as well as leading you alongside the base of a tall rock wall. Bumble Hill Dray track was cut during the mid 1800’s to allow teams of bullocks to haul felled cedar to Mangrove Creek, where a barge would take it to Sydney. The oxen are now long gone, but this is a great way to lead into the small Yarramlong township. 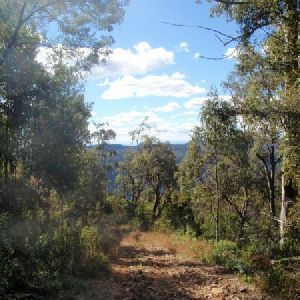 This walk follows the Great North Walk from Greta road to the Cedar Brush track head, via the Bumble Hill Dray track and the Yarramalong General Store. 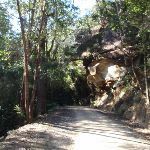 While most of this walk is on the road, it does provide a good, mostly level bushwalk and a great stroll along a quiet country road, through a pleasant rural community. The Yarramalong general store is a great place to stop for lunch. 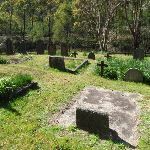 Yarramalong is worth exploring, and the historic church is worth a look. 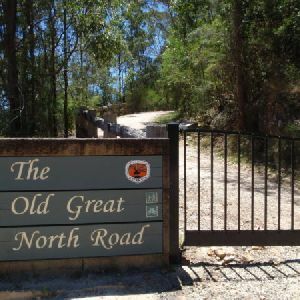 This section of the Great North Walk starts from the Yarramalong general store and follows the roads to the Cedar Brush track head. From here the walk heads north through the Olney State Forest to the Basin Campsite. On day two, the walk continues north, through the State Forest, to Mt Warrawolong, where there is a side trip to the peak. The walk finishes by heading down the ridge to Watagan creek road. 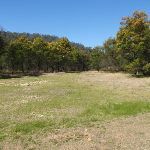 Starting at the quaint Yarramalong township, this walk follows a couple of rural roads to the Cedar Brush Trackhead. This is the longest road stretch on the Great North Walk. Some people see this is a road slog and either grab a lift or power walk it, others see it as an opportunity to stroll through the country side. However you choose to undertake this section of the walk I encourage you to enjoy the valley views and soak up the vibe on the semi secluded rural valley community. Starting with a walk through the streets of urban Somerbsy, you soon leave the farms and head into Palm Grove Nature Reserve. First you will follow the signposted track down the open dry ridge to the dense rainforest. In this valley you can explores the moist rainforest with towering Eucalypts, Strangler Fig trees, Cabbage Palms and a tangle of vines. From here walk up the rocky track to another dry ridge, where you can follow a side trip to a flat clearing and designated campsite. From near the campsite the track winds down through another moist forest and past more Cabbage Palms before coming to the signposted Ourimbah Valley Trackhead on Ourimbah Creek Road. http://new.wildwalks.com/wildwalks_custom/includes/walk_fire_danger.php?walkid=nsw-dharugnp-dgtumc Each park may have its own fire ban, this rating is only valid for today and is based on information from the RFS Please check the RFS Website for more information.